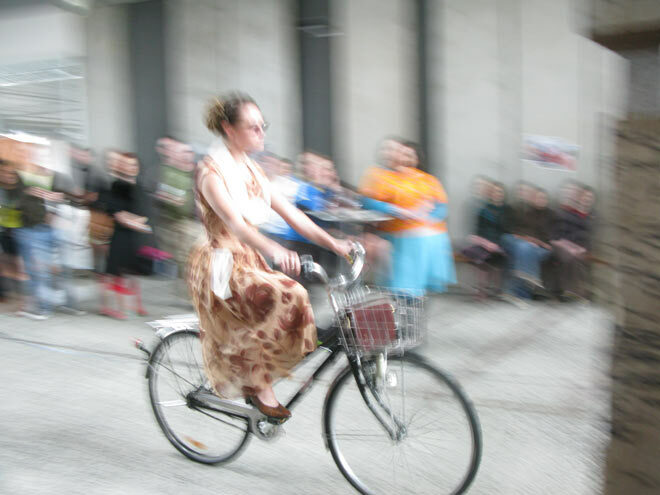 We went to Wheel Stylish yesterday, the bike fashion show in Wellington, put together by the clever folks from Frocks on Bikes Wellington at the BNZ Harbour Quays Atrium. 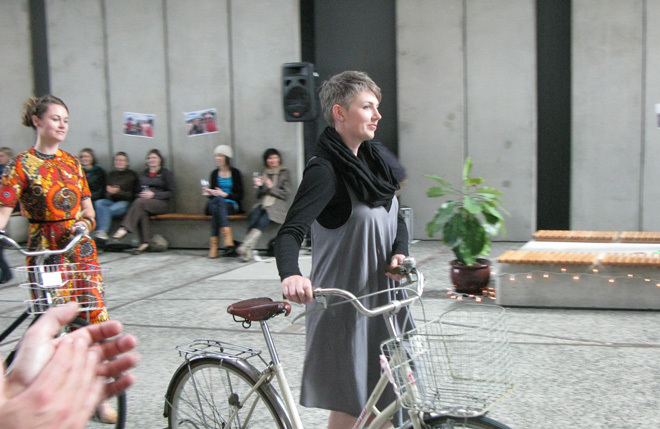 A nice concept: bring city bikes and sustainable fashion together and show cycling can be very stylish. The better part of World Sweet World, Hannah, was taking part in it as a model, and happily showed off pieces by kowtow. The other labels were emma, starfish, voon and de nada, and there were some pieces from hunters and collectors, all presented by a number of other beautiful models, but the actual combinations of labels and models completely escaped me, having to juggle Otis and at the same time trying to aim at moving fashion targets. 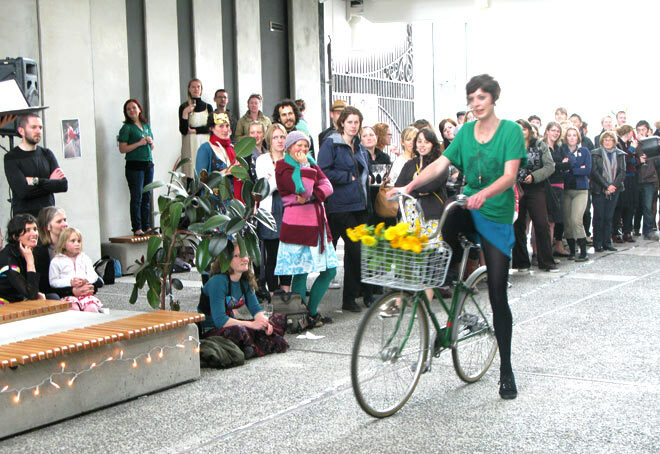 We were stoked to get the chance to talk to Celia about dressing sustainably while still looking snappy as a Councillor. 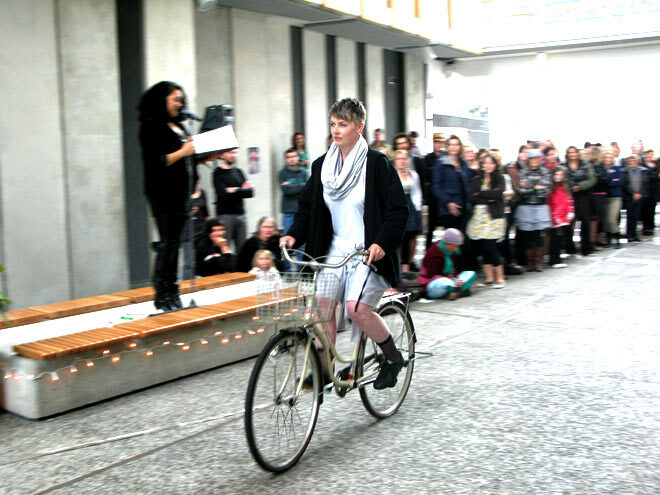 Especially in the lead-up to the Wellington Mayoral elections, it’s great to see how an environmental conscience doesn’t stop at the fashion gate (so to speak), and, at any time, it’s refreshing to see politicians do what they preach. Celia, you got my vote! 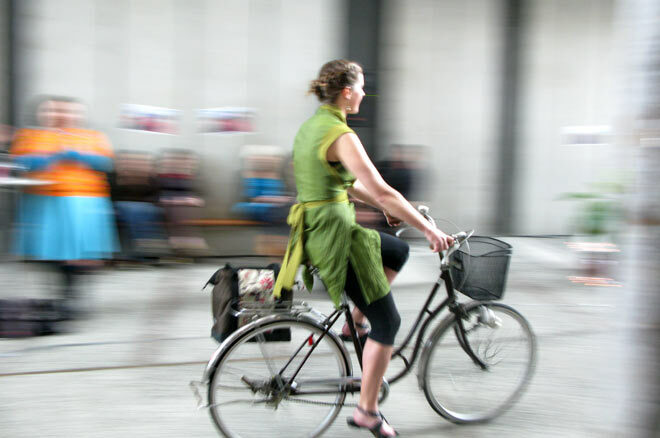 What is your motivation behind making sustainable fashion decisions? Getting ready for the Mayoral campaign has been a learning curve I’ve relished. 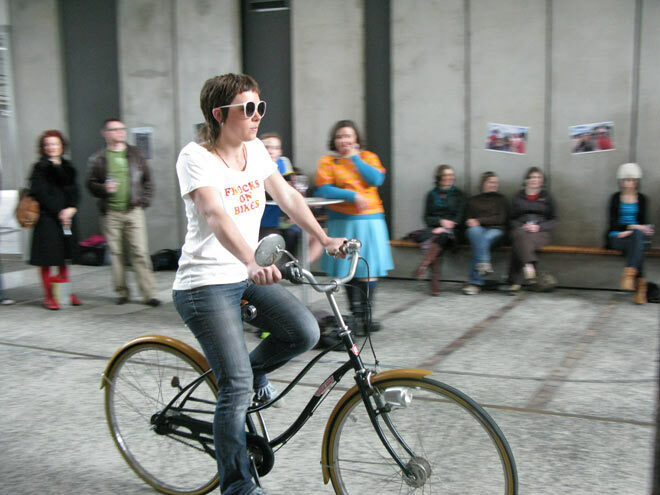 As well as explaining new policy and good achievements like safer cycling, light rail, computer access for refugees, cleaner city harbour, ultrafast broadband, Fairtrade Capital and community gardens, now I have to dress to show I can lead the city, without sacrificing my values – or over-spending. Fortunately, choosing clothes can be fun and sustainable! How do you go about finding the right stuff? After a few colour tips from Samantha Hannah, I met some very sympathetic Wellington fashion designers and added to my op shop collections. A quick explore when I’m passing the Salvation Army in Rintoul St, Taranaki St or Tawa is usually worthwhile, even for basics like jeans. In more up-market spots in Cuba Street like the Recycle Boutique or, for something really special, Ziggurat, I often find a beautiful bargain. Jewelry is either a few well-loved pieces from my mother, made by myself or sourced from Trade Aid for a splash of colour. What did you score in your latest quest? I wanted smart pieces in cream so I enjoyed choosing a linen jacket from Untouched World, a silk shirt from Starfish and an end-of-line bargain from Voon. I’m sure these choices will last me for many years. Janet Dunn has set up ReDunn Fashions to up-cycle pre-loved clothing and I bought this amusing jacket at her first soirée. 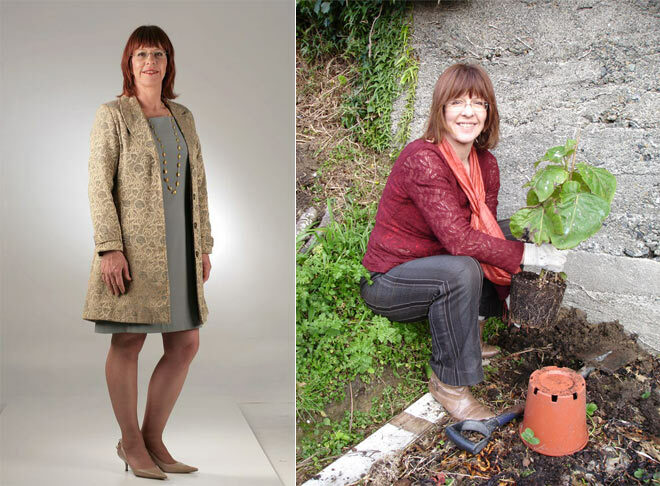 Natural fabrics, recycled gear and new ethical items make a happy combination -lovely clothes and good businesses. 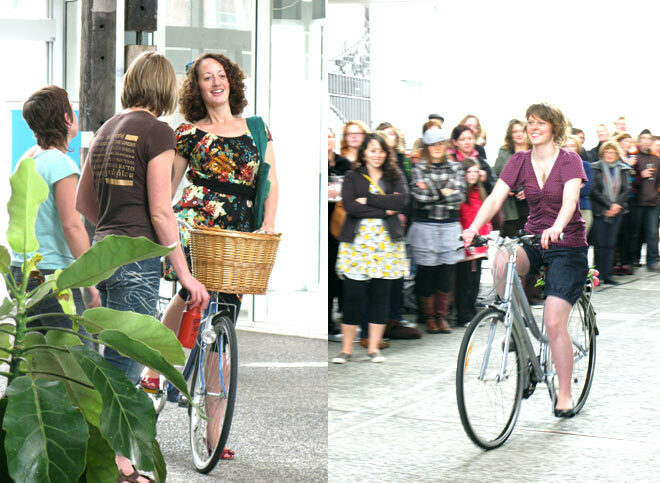 Left: Full-length-jacket $17 from Salvation Army, Taranaki St. Suit from Secondo, Tinakori Rd. Beads from my mother. Shoes – I think I got married in these! Right: This was at the Brooklyn Community Gardens last weekend, planting a tamarillo I took from my home garden. Andrea Moore top from the Brooklyn Frock Schwap. Scarf from mother. Trousers from some Salvation Army store. Right: Jacket from the 6th Annual Preloved Fashion Sale. Silk blouse (feels fabulous!) from Starfish. Beads from Trade Aid. A bit behind, but oh well, it’s been a busy week. 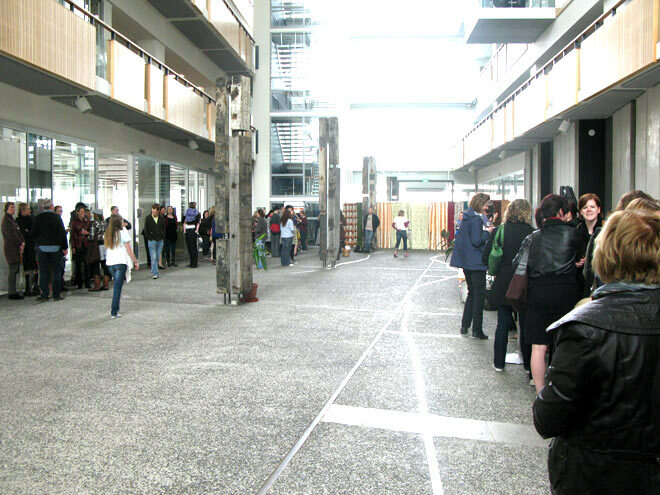 Last weekend there was a workshop on Sustainable Style at the Southern Cross, organised by the 42collective. World Sweet World took part, showing people how to turn an old jersey into mittens and a scarf, based on the project received from Tara Robertson. It was a lot of fun, with Emily Cotter showing how to mend/ hemm/ make something new from something old and Connie Nisbet sowing a dress out of a sheet.